Of Course You Can Hike a 465-mile Mountain Trail! I was giving up. I didn’t want to do this anymore. My clothes were soaked with sweat, my legs and arms covered in scratches from overgrowth taller than I was. For hours I had been wrestling my way through thick vegetation that didn’t allow me to see anything around me, not even Coen, who was walking only a couple of meters in front of me. I felt the exhaustion wearing me out and the sense of insecurity that I had kept at bay for so many days recurring in full force. 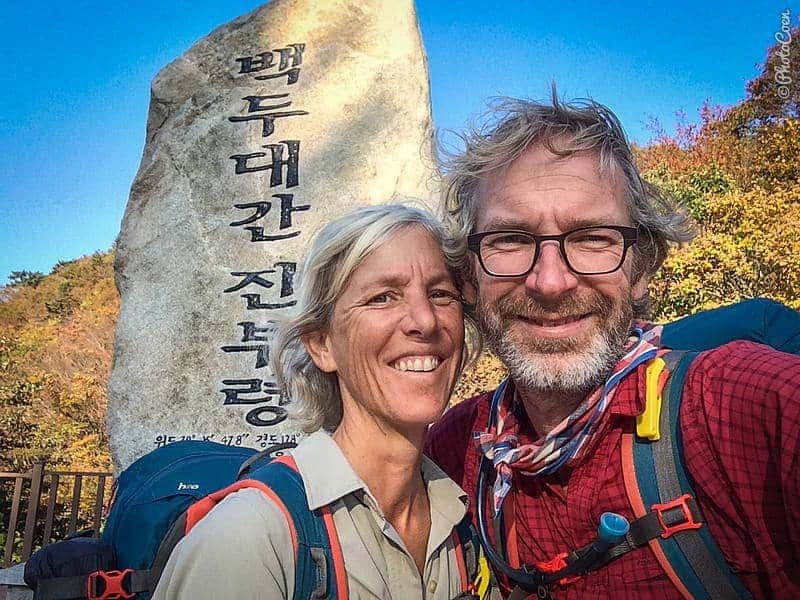 I had been set on hiking the 465-mile Baekdu Daegan Mountain Ridge in South Korea the moment I read about it. 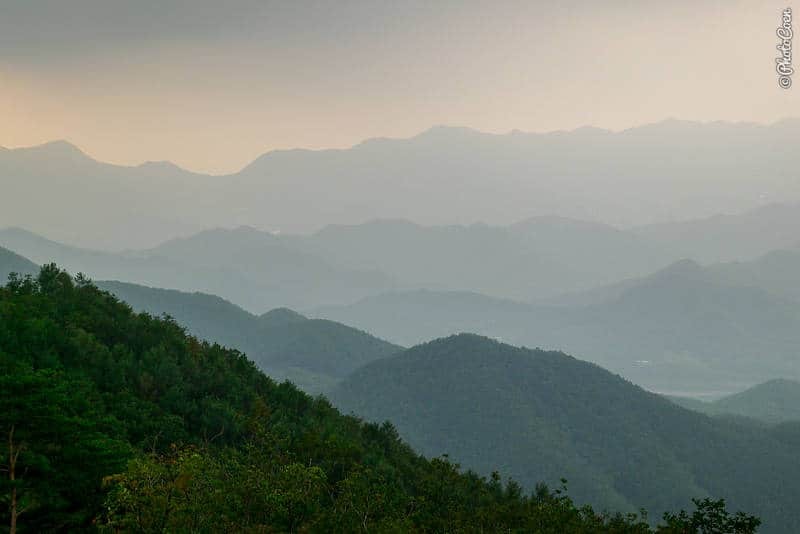 I was enticed by images of vast mountain regions covered in forests and home to colorful Buddhist temples, mountain shrines, landmarks from ancient civilizations and monuments honoring the Korean War. Coen had expressed his doubts. I was suffering from a constantly recurring anemia as well as endometriosis. The latter causes, among other things, sudden cramps that make me stop in my tracks while trying to keep breathing, and a constant sense of feeling tired or exhausted. However, I had wanted to do this hike and convinced Coen to give it a try. Now I was giving up and a feeling of defeat was crushing me. When vegetation made way for forest we sat down in the shade, ate a handful of nuts and discussed our options. I wanted to quit. Coen wanted to continue. I suggested to stop for now and return in a couple of weeks, when the heat wave would be over. Since the temperatures were getting to Coen as well, a period of rest sounded reasonable. 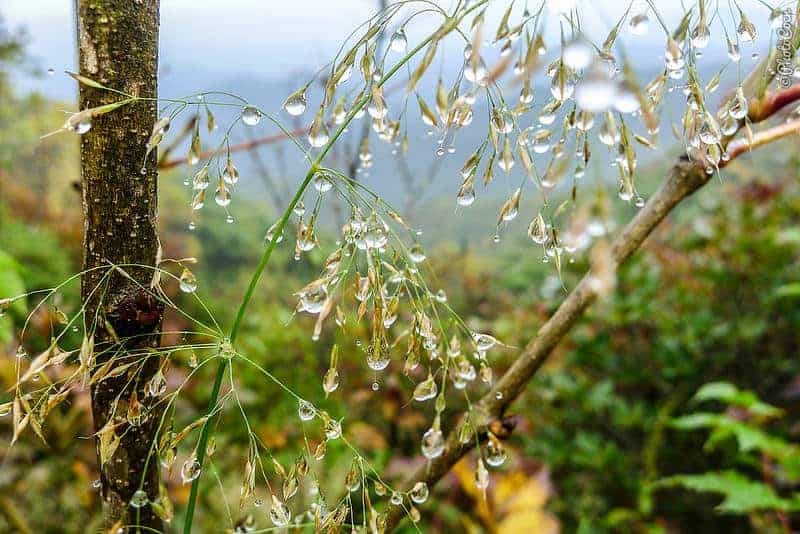 Read More: Why Hike the Baekdu-daegan Mountain Ridge? Frankly, I had little confidence that I was going to be up to the rest of the hike but didn’t express those doubts. I didn’t have to take that decision now. We hiked down the mountains and hitchhiked back to where our car was parked. We visited a public bath for a major body scrub, took a rest, and made our way north to Seoul to see some friends. On the way we stopped at the entrance of Odaesan National Park to visit its famous Woljeongsa Temple. Next to us in the parking lot was another car. A man stepped out and introduced himself. 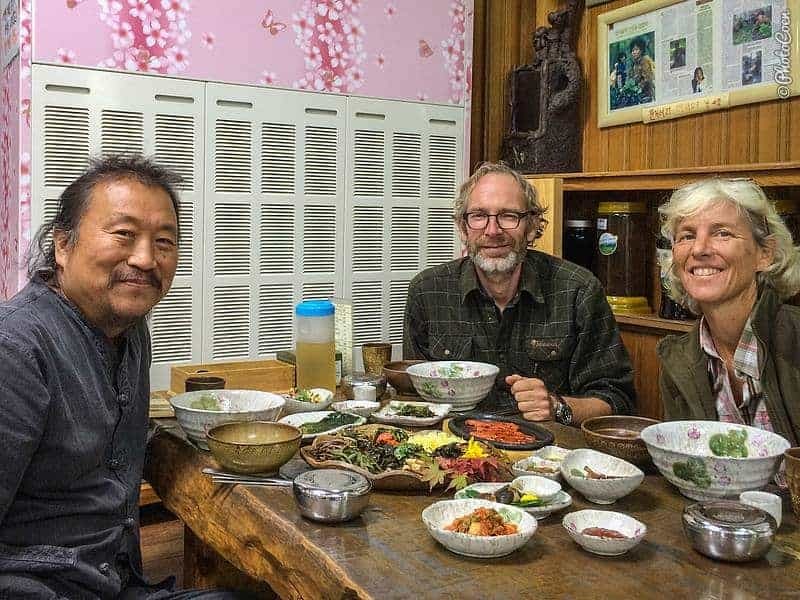 Jonghae was smitten with our road journey of more than twelve years in Asia and South America and invited us to lunch. We learned he had an advanced stage of cancer and regularly underwent chemotherapy. He had gained weight, his shoulder-length hair was very thin, and he had trouble finding the right words in English – all results of the treatment, he explained. 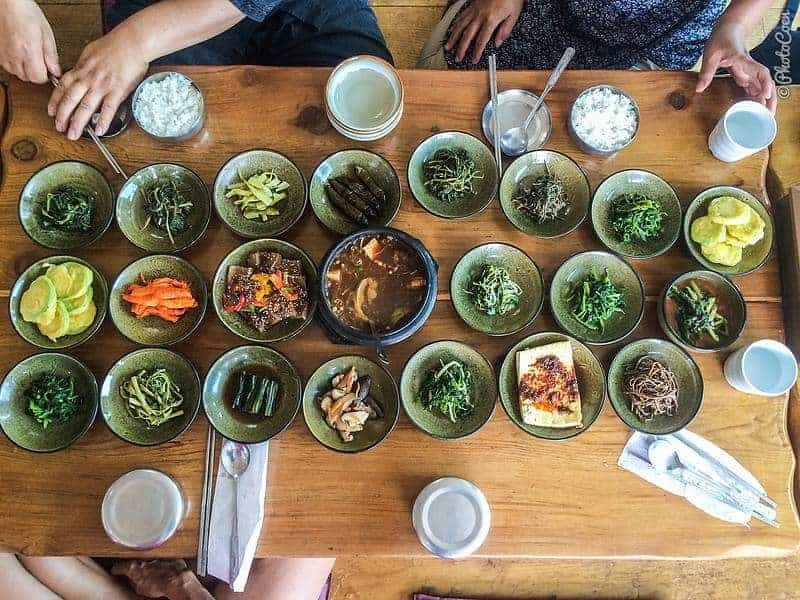 As we squatted around a low table in a restaurant and savored a mountain-vegetable jeonshik – a type of set-meal with a bowl of rice and all kinds of tiny dishes of vegetables, tofu, mushrooms that will be topped up as often as you like – he shared his passion for hiking and traveling. Despite his illness he had traveled the Karakorum Highway in Pakistan the previous year and he wanted to drive the Pan-American Highway from Canada down to Argentina. We told him about our attempt to hike the Baekdu Daegan and I expressed my doubts, about the heat and the exhaustion. He, on the other hand, immediately became enthusiastic. 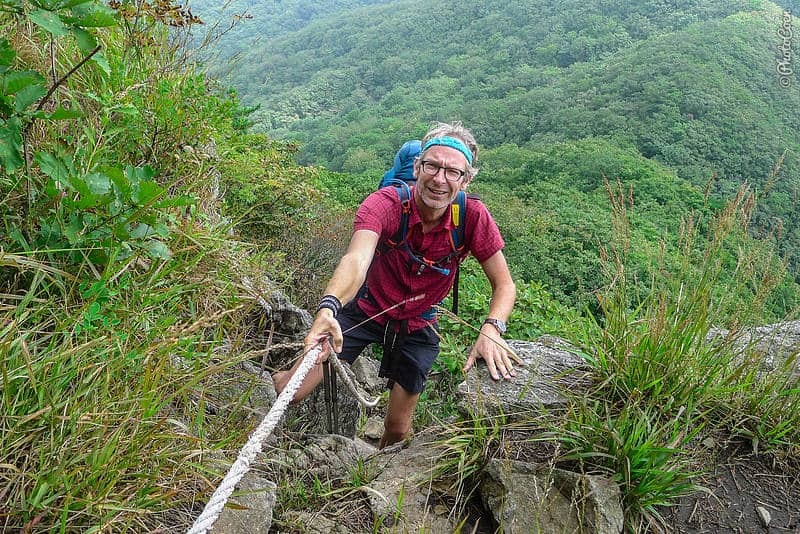 He had hiked the ‘White Mountain Ridge Trail’, as Baekdu Daegan translates, three times. Even now, sick as he was, he hiked every day. “It is what keeps me alive,” he commented. The doctors confirmed this was most likely helping him to fight his cancer and deal with chemotherapy. But Jonghae’s ambitions had gone beyond his own hiking adventures. He wants city kids to connect with nature and get to know their own country. In 2005 he set up a program at the Middle School where he worked in Seoul. 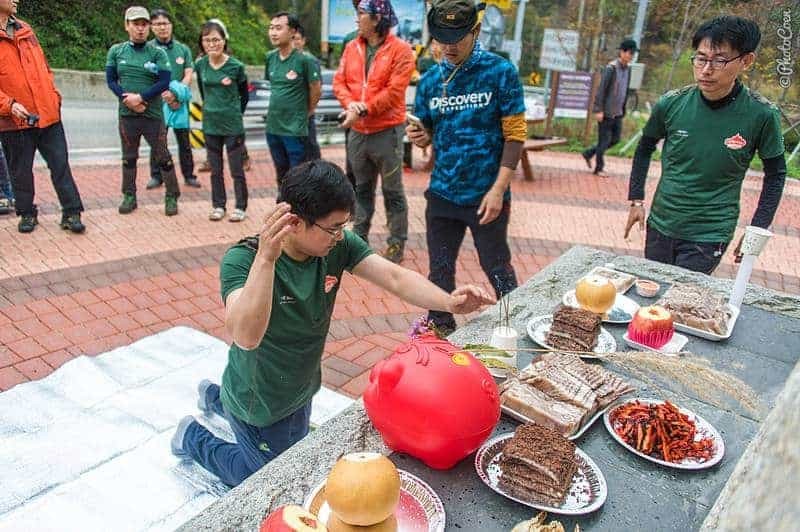 Children around fourteen years old, plus their parents or siblings if they want, hike the trail two days a month, so it takes them one and a half years to complete the Baekdu Daegan. Jonghae’s enthusiasm stirred a new energy in me too. Maybe I needed more willpower? Maybe I expected to fail and gave up too quickly? And if 14-year-olds could do this, shouldn’t I be able to do it? I felt the fire returning in me. Maybe if we walked the trail in shorter sections, took more breaks… I started making new plans already. Five weeks later, with the intense summer heat gone, we were back on the trail. It was an experience never to be forgotten. Oh yes, I struggled and cried and yelled I was going to throw the towel in once more. But then I would think of Jonghae and the kids and push on. For a large part I loved the rhythm of hiking, and felt deeply privileged and blessed to be doing this. 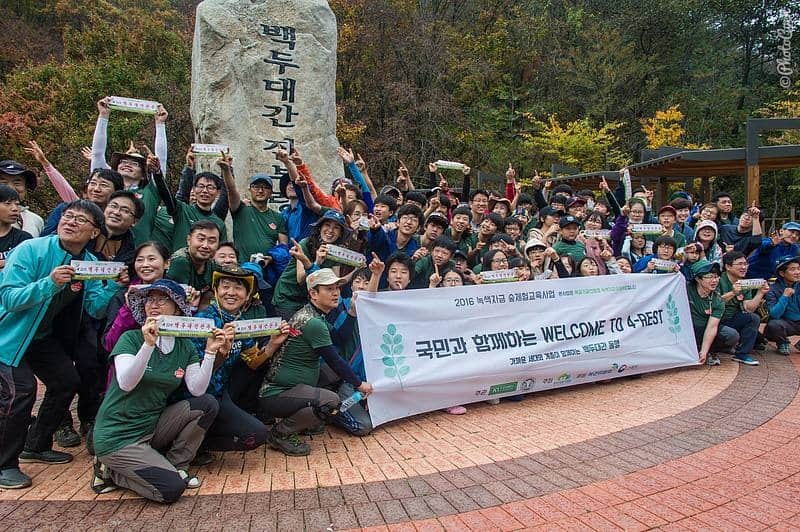 During weekends South Koreans are out in the mountains in large numbers and we met many. They have a culture of sharing: a candy, an egg, a sip of soju and sometimes we would sit together for a short break or a meal. 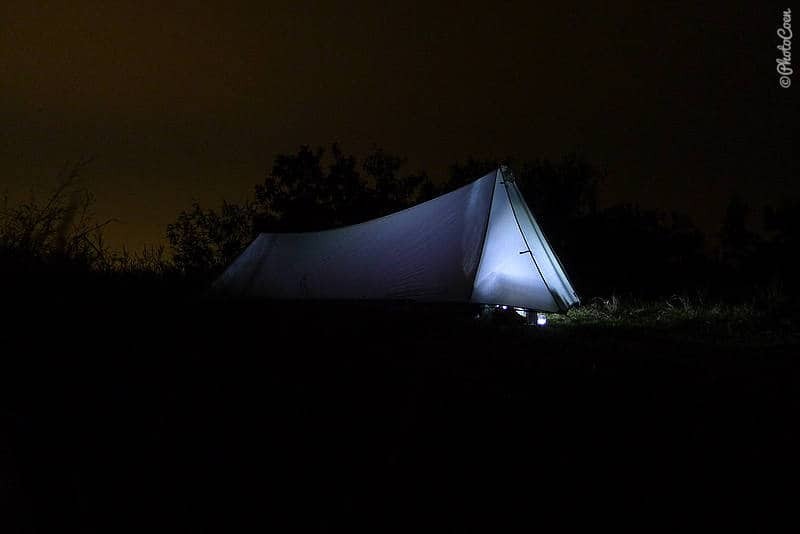 People who live along the trail invited us to stay at their place, offered a meal or stuffed our backpacks with cucumbers, bell peppers or apples – whatever happened to be harvested. These were all moments to feel invigorated again, to bring a smile to a body that was hurting, to have confidence again, to feel a sense of kindred spirits. 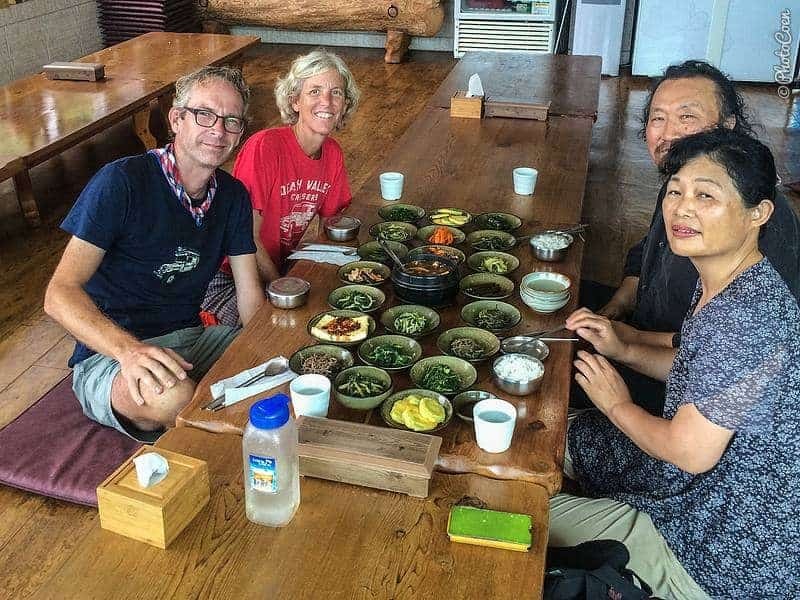 I felt a deep appreciation for Korean culture and people and we learned much from their generosity, hospitality, smiles and willingness to help. 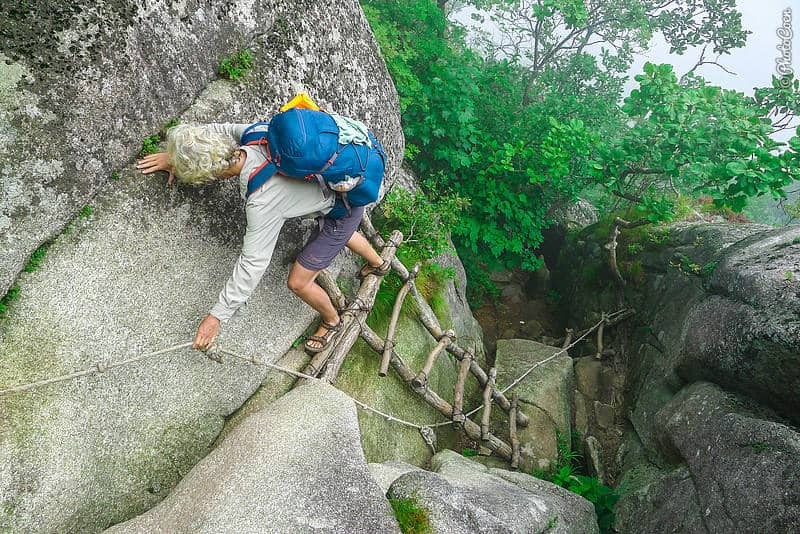 In fact, hiking the Baekdu Daegan is a perfect introduction to South Korea’s culture. It took us forty-seven days of hiking to reach the finish. To arrive at that last stele with ‘Baekdu Daegan’ depicted in Korean characters, of which there are dozens along the trail, was a bit of an anticlimax. Suddenly the hike was over. Or so we thought. That evening we received a message. He had given up his presidency of the organization a few years earlier because he got cancer but he was staying involved as much as possible. For the first time in three years he was able to hike a section of the final day. 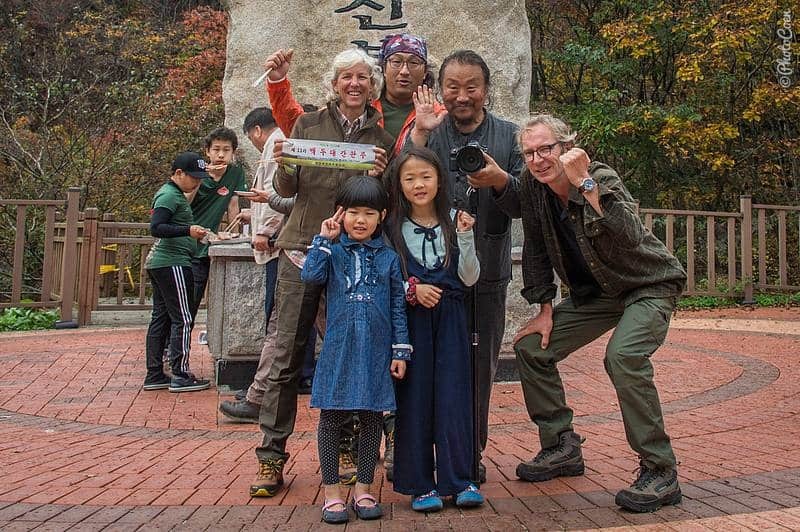 We applauded the kids as they stepped out of the forest onto the pavement, and walked the last meters to the monument that signifies the end of the Baekdu Daegan in South Korea (the trail continues into North Korea but is off-limits). Jonghae took pictures of them all. A group of 45 students and 45 family members had completed the hike, the youngest being 10 and the oldest 75. As the group offered food and water to the mountain spirits we joined them in prayer to thank the mountain spirits for a safe return. Contrary to our finish the day before, this ceremony felt like a fitting closure of our adventure and I was thankful to Jonghae for making us part of the experience. Before his ‘breath was to become air,’ as Jonghae to eloquently phrased his dying, we visited him in the hospice near Seoul. Optimistic as ever he chatted about having plans to return to Pakistan and China, albeit in a wheelchair because cancer had paralyzed him. His joy for life and his faith in being able to travel again was so intense that his passing two weeks later, September 26, caught us off guard.